Delsey is well-known for their luxury design and contemporary style. The Delsey Helium Aero Carry-On is another impressive piece by Delsey. I love the professional look and lightweight yet sturdy feel of this piece. I would definitely take this carry-on along for a business trip or weekend getaway. It’s also expandable, so when I end up bringing home more than I left with (as usual 🙂 ) I’m all set. I think this luggage is right on the money in regards to sturdiness. It’s equipped to last for years of travel use. 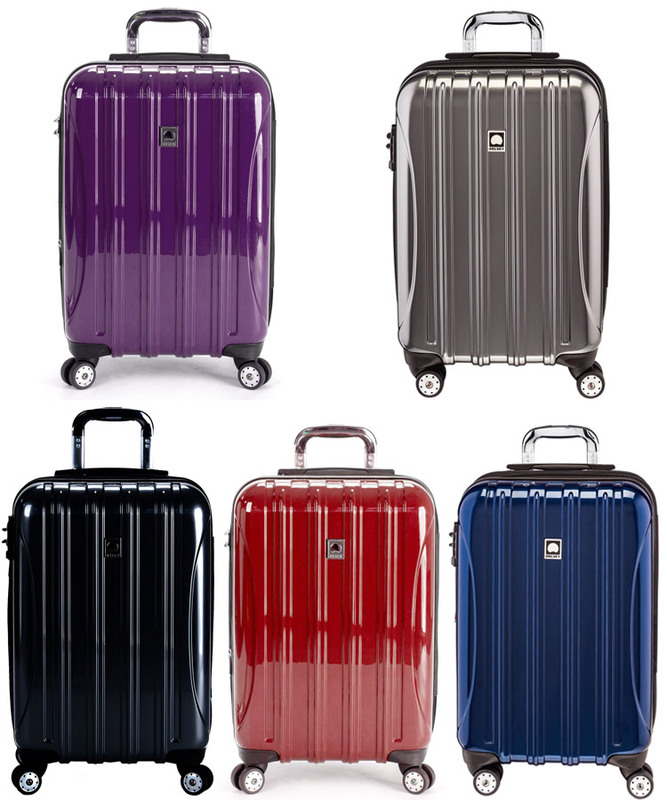 The hardcase is 100% polycarbonate like many Delsey suitcases. It’s not only attractive but more importantly very durable while still being lightweight. I’m guilty of the whole rearrange my items, sit on the luggage, pull the zipper, and repeat until you get the bag closed, routine. But this Delsey luggage expands to give you 2 extra inches. With a carry-on you always need it. By the way, all the zippers are different colors so that you know which zipper is for what. That’s the first time I’ve seen that. The wheels glide effortlessly on various surfaces, and the spinner design allows for 360 degree maneuvering. The retractable handle feels comfortable in the palm, and pushes back flat against the case when I’m not using it. I really love the glossy finish because it can be easily wiped clean. It also has a neat ribbed texture that make it stand out more, compared to a flat finish. All the color options are really contemporary. The purple is a very beautiful shade, and not too feminine. The red stands out the most, and the titanium is a great modern yet professional color. The fully lined interior offers two packing compartments. One side is with a zippered divider, along with compression straps behind the compartment. On the same side is an extra small zipper pocket. The other side also has compression straps. I thought that was pretty cool because most luggage pieces do not have the compression straps on both sides. Included in the middle is a small pocket. The compartments make it much easier to keep the bag organized. Even if the bag gets tossed around everything stays neat and secure. The Delsey Helium Aero Carry-on comes in 2 additional sizes, besides the 21″ that I am reviewing: 25″ and 29″. It’s true great features and design are only as good as they last. Delsey has established a reputation for strong and durable luggage. The Delsey Helium Aero carry-on seems to stay true to the brand’s good reputation. Ribs across the front of the case seem to help reduce bowing when heavy items are placed on top of it (when closed). The corners appear sturdy and I didn’t read any reviews about them cracking, as is the problem with some hardside luggage. The one thing that holds me back from giving this piece a 100 on durability is the lock. 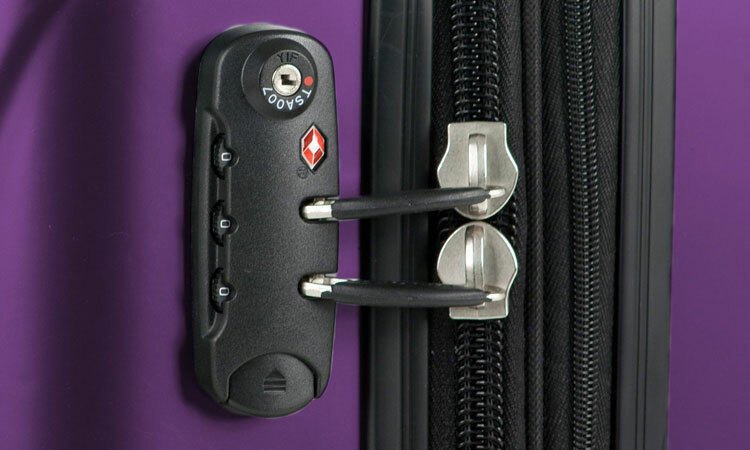 One reviewer reported the combination lock broke after 5 months use. This could have been because of airport rough handling, or customer use. It was only one review, but either way the problem can’t be ignored, since the combination lock is a big selling point for this piece. A more common complaint is that the case scuffs easily. This is an issue with most hardcase luggage. And because of the glossy finish, the scuffs or scratches stand out even more. 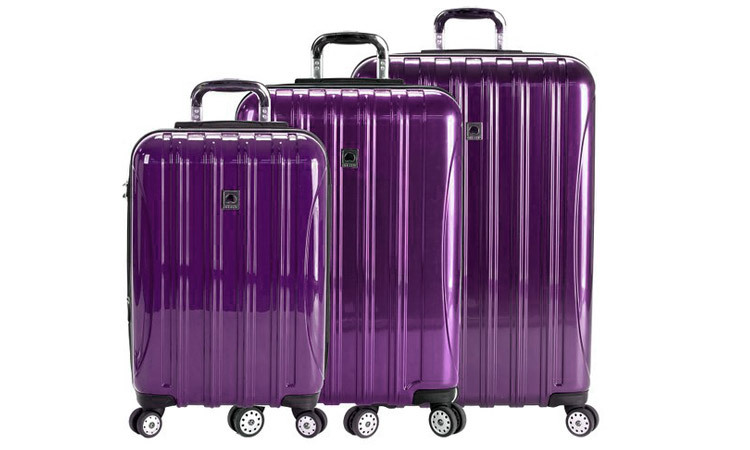 But this is a drawback you have to except unless you go with textured or matte-finish hardcase luggage. 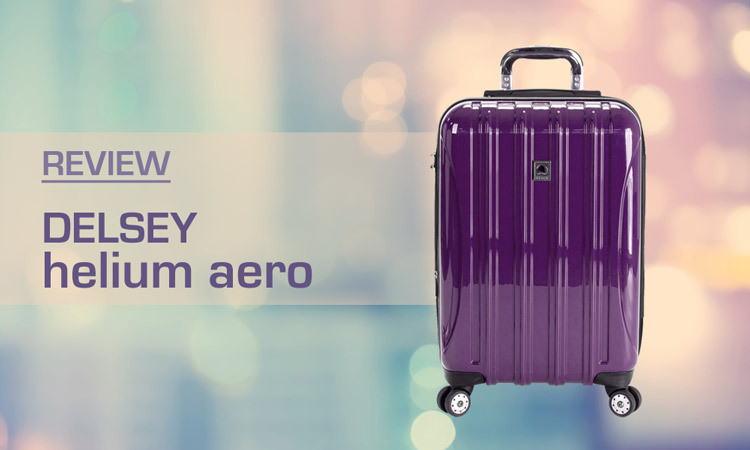 The 21″ Delsey Helium Aero Carry-On can be found around $100 and up, depending on what kind of sale you find. I feel this is a great price for a product that will most likely withstand years of use. Delsey has more expensive models to choose from with some more fancy features, but this is nice mid-range option while still getting the Delsey brand and durability. “Light as a feather!” one reviewer said, which is totally what I want in a carry-on. 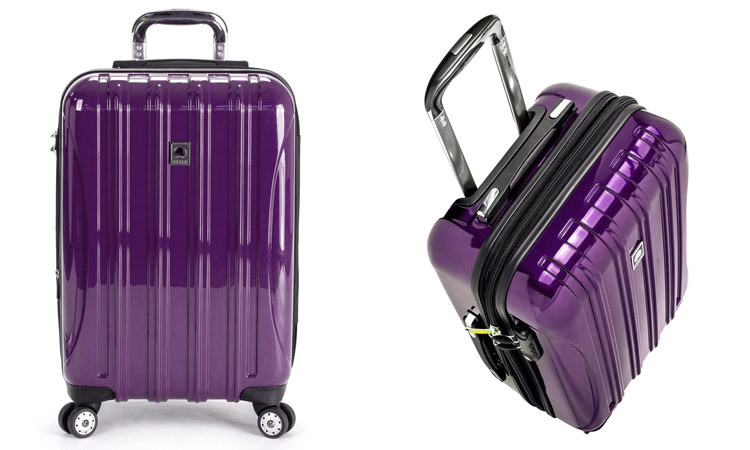 At only 8.4 pounds along with the feature of the 4 spinning wheels this luggage will not likely be a source of back pain on a trip. 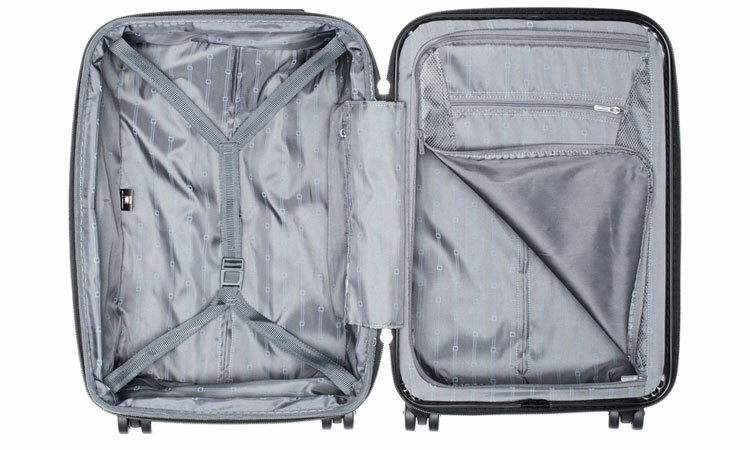 As for the claim that the case is oversize, most airlines accept the measurements for carry-on requirements. This Desley is exactly 20.5″ with the wheels, and airline regulation is 22″. The real problem is probably smaller overhead bins on some domestic flights, and not the size of the luggage itself. Modern, durable, professional, and at a great price. The Delsey Helium Aero carry-on is a great mid-priced luggage choice you can pick up on Amazon. 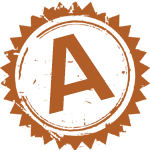 It will be perfect for a variety of people for business or personal use. For a Delsey carry-on that does not scratch so easily, then I recommend the textured finish of the Delsey Chatelet. For a lower cost option, see the Rockland 20″ Carry-on or Samsonite Underseater.